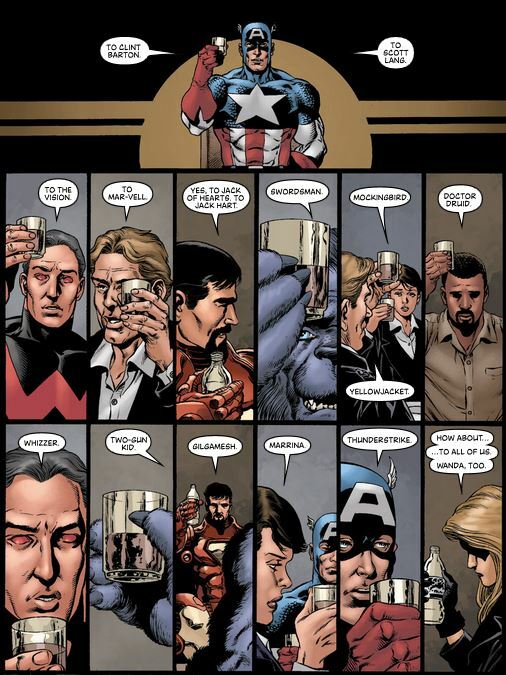 Bendis and Perez send the Avengers off with class. A man who hasn’t touched a drink in years suddenly finds himself inebriated and unable to maintain his composure at the most inopportune time. A woman known for her control unexpectedly loses it, though she never has before. Former allies strike out against allies, leaving only death and destruction in their path. For a team that has faced its fair share of dark days, “Avengers: Disassembled” may easily be their darkest. Unfortunately as the story chugs along, laying waste to members of Marvel’s classic super team and their once golden reputation, the story feels detached. While all hell breaks loose, the story goes through its horrific motions but there’s rarely a sense of dread or loss as some classic characters are taken down. Only during a quiet moment between a distraught Hank Pym and his former wife, Janet Van Dyne, does writer Brian Michael Bendis find the heart in his main story. Perhaps Bendis chose to hold off on the poignancy of the material until he reached the series epilogue, but we’re left with a shell of a story that isn’t an immensely satisfying conclusion to one of Marvel’s longest running titles. “Avengers: Disassembled” jumps immediately into the action as the thought-to-be-dead Jack of Hearts returns to Avengers Mansion not looking too healthy. As soon as Ant-Man approaches the ramshackle hero, Jack explodes, making he and Scott Lang the first victims of the story. Across town, Tony Stark is speaking to the U.N., and mysteriously finds himself drunk and preparing to murder a Latverian diplomat. Before the Avengers can catch their breath, the Vision crashes onto the mansion grounds with a cryptic warning before unleashing a pack of Ultrons who begin a violent battle with the team. Chaos continues as She-Hulk loses control and begins rampaging on her teammates. Friends turn against friends when Tony tries to defend himself against accusations that he is drinking again. Soon S.H.I.E.L.D. and a small army of former Avengers are on site to join the fray as the ante is upped again: a Kree invasion has begun and New York City is being laid to waste. Hawkeye ends the battle by sacrificing himself in an admittedly heroic act that just does not feel befitting a hero of his stature. The Avengers can only speculate about how all of these acts might be tied to one another, but the pieces aren’t fitting together for them. A compelling argument is made for the madness of Wanda Maximoff. Artist David Finch capably brings the blockbuster action of Bendis’ script to life, but the artists’ strength is not in the faces of his characters. There is a soullessness to their eyes and the shape of their heads too often lack dimension. Finch’s details are terrific, reminiscent of Jim Lee, and the complexity he brings to the characters costumes force you to slowly move your eyes across each panel. A two page splash of the Avengers staring up at the sky as the Kree Armada descends upon New York is one of Finch’s most powerful pieces from the entire book. Colorist Frank D’Armata smartly keeps most of the action colored in deep red hues to illustrate that this is a hell of a day for the Avengers. 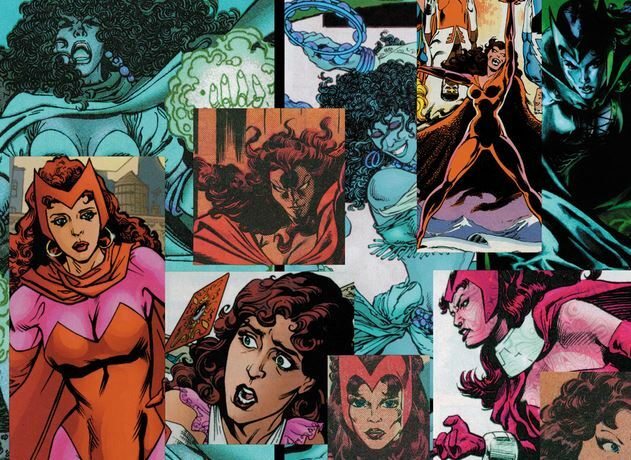 It isn’t until the fourth chapter, in which Doctor Strange reveals that former teammate Wanda Maximoff, the Scarlet Witch, is behind all of the pandemonium that the Avengers have experienced on this awful day. In a pair of beautiful two page spreads, Dr. Strange lays out the facts as succinctly as Hercule Poirot as the Avengers stand and listen objectively about the unbridled power of their teammate. The pages feature classic images from the sixties to the present as Dr. Strange makes a compelling case against the now-demented Scarlet Witch. Soon all is revealed and the Avengers are forced to take down their own. In the end they are left with nothing. By the time we reach the series epilogue, titled “Avengers Finale”, Bendis slows the story to a halt as the team members eulogize themselves in what is a monumentally touching close to the series. For the lack of emotion that came before it, the next 36 pages ought to satisfy fans of the series and make this trade a must for your bookshelf. The story opens with founding members Hank and Jan standing outside of the destroyed Avengers Mansion in a sequence drawn by longtime Bendis collaborator Alex Maleev. Inside former Avengers sit at their famous table and talk about their best days as a cavalcade of fantastic artists bring classic Avengers battles to life. Eric Powell presents the first five Avengers crashing through terrain while reminding us that their beginnings were fairly humble. Darick Robertson beautifully reimagines Cap being unfrozen by his teammates. Gary Frank reignites the 70s with a galactic battle against the all-powerful Korvac. All of this is great, really great, but the chapter ends classily with a beautiful close by the great George Perez. Perez’s final pages, with an economy of words by Bendis, are a touching cap to the series. The heroes toast the teammates who have fallen, before they walk out to a moving tribute by the citizens of New York who have not forgotten them. Sadly, however, the band of heroes known as the Avengers has disassembled.